Born with the name of Catherine in 1566, St. Mary Magdalene de Pazzi received a religious upbringing. She was initially sent to the Monastery of St. John as a boarder at age 14, but was taken back home by her family who opposed her religious vocation and wanted her to marry well. They eventually gave in, and Catherine became a Carmelite of the Ancient Observance at 16, taking the name Sister Mary Magdalen. 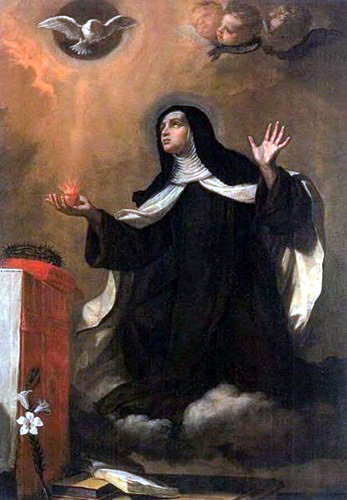 St. Mary Magdalene de Pazzi was endowned with the gift of prophesy and lived as a mystic. In 1598 she became mistress of novices and she was chosen as subprioress in 1604. She would hold this position until her death of natural causes on May 25, 1607. The final three years of her life were filled with intense bodily and mental sufferings but the saint prayed to suffer more. She led a hidden life of prayer and self-denial, praying particularly for the renewal of the Church and encouraging the sisters in holiness. She foretold the elevation of Pope Leo XI in a prophesy shortly before her death. O God, lover of chastity, who didst inflame the blessed Virgin, Mary Magdalen, with love for Thee and didst adorn her with heavenly gifts, grant that as we honor her on this festal day, so may we follow her in purity and love. Through our Lord . . .